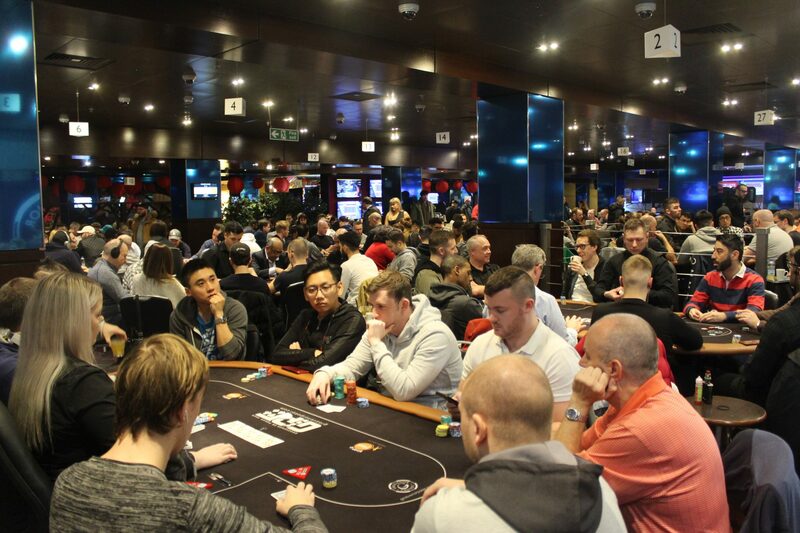 The 2019 GUKPT is off to a flying start after a record-breaking week at London’s The Poker Room. Both the £200,000 GUKPT Main Event and the £20,000 GUKPT Mini Main Event both hit record entry numbers with 467 and 395 runners respectively. Grosvenor Casinos was ecstatic to witness such outstanding numbers throughout the week, kicking off the 13th season of the UK’s premier poker tour in suitable fashion. The GUKPT Main Event generated a staggering £467,000 prizepool with a top prize of £122,460. However, a deal between the final three players meant this was adjusted to £100,000. The first GUKPT winner of the year, who would like to remain anonymous, had their work cut out for them with players such as poker superstars Martin Jacobson, Ludo Geilich and Patrick Leonard all making deep runs. The gruelling heads up battle concluded as both players were dealt an ace and all the chips went in the middle. It was eventual runner up Alexios Zervo holding A4 who ended up with the healthy consolation of £80,000 to help soften the blow of just missing out on the title. Zervos is no stranger to final tables at the GUKPT London Main Event. He finished 7th in the 2017 GUKPT London and on current form we’re sure it won’t be the last time we hear his name at a major final table. Congratulations to all GUKPT London finalists and a special mention toGrosvenorpoker.com satellite winner Andrew Garland who turned his £110 Super satellite buy-in into a £11,500 payday. 5th – £20,100 – S.B. Grosvenor Casinos’ National League has been updated with results from the GUKPT London Main, Mini, PLO, £250 NLH and Bounty event all added to the leaderboard.Grosvenorpoker.com also debuted its first ever online GUKPT Main Event last night. Thanks to all 110 players who took part and well done to “ottilieangela” for winning the inaugural title and the £2,750 first prize. The 2019 GUKPT moves on to Manchester and just like London, it will feature a £200,000 GUKPT Main Event with a £1,110 buy-in. As always, customers can win their seat online atGrosvenorpoker.com for as little as 25p, as well as at the host casino, Grosvenor Casino Bury New Road, Manchester. In the meantime Grosvenor Casinos is playing host to plenty of poker action including the£25,000 Guaranteed 25/25 taking place in Portsmouth, Leeds, London and Birmingham this month. There’s also the all new Deepstack which will be making its debut appearances in Stockton, Liverpool, Dundee, Glasgow, Bolton, Walsall, Portsmouth, Luton, Sunderland and Leeds.